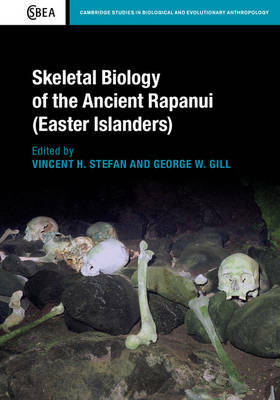 Author(s) Stefan, Vincent H.; Gill, George W.
Disseminating what is currently known about the skeletal biology of the ancient Rapanui and placing it within the wider context of Polynesian skeletal variation, this volume is the culmination of over thirty years of research into the remotely inhabited Easter Island. Compiling osteological data deriving from Rapanui skeletal remains into one succinct analysis, this book demonstrates how the application of modern skeletal biology research techniques can effectively be employed to address questions of human population origins and microevolution. Craniometrics and DNA analysis are used to provide indications as to Rapanui ancestral lineage. Evidence is presented in a user-friendly manner to allow researchers and graduates to critically analyse the current knowledge of prehistoric Rapanui skeletal variation. An important resource providing valuable evidence from human biology that modifies earlier archaeological and cultural anthropological views, this book will stimulate further research into the Rapanui.